At some point in the movie Maja asks you to notice how “the ancient houses are squeezed to half their width.” This is due to the infamous length contraction: objects that move with respect to you shrink along the direction of movement. They literally take up less space. Below you can speed up to 85% of lightspeed and see for yourself how the boats and buildings at the quay of the beautiful Graslei get contracted. Light travels at a finite universal velocity. This has a profound impact on what we see at a given instant: the further the object, the more we see it in the past. In the world of Captain Einstein, with its slow speed of light, this ‘vision delay effect’ produces severe distortions for the moving objects like the bending church and the curved towers of Ghent. Below you can gradually turn on this vision delay effect, starting from the length contracted quay and ending at the correct image. The boat is travelling towards the left or – it’s all relative! – the quay is moving towards the right. Can you understand the way the houses are bend? Hint: the roofs of the houses are further away from your eye than the groundfloors. Through our colour perception we sense the different wavelengths that are carried by a certain light beam. However, the received wavelengths depend on our motion with respect to the light source. It is this Doppler effect that produces the spectacular colour changes during the Captain Einstein experience. In the animation below you can ‘paint’ the correct Doppler shifted colours on the distorted length-contracted image. Check our Doppler extravaganza for a more detailed explanation on the resulting colour pallet. 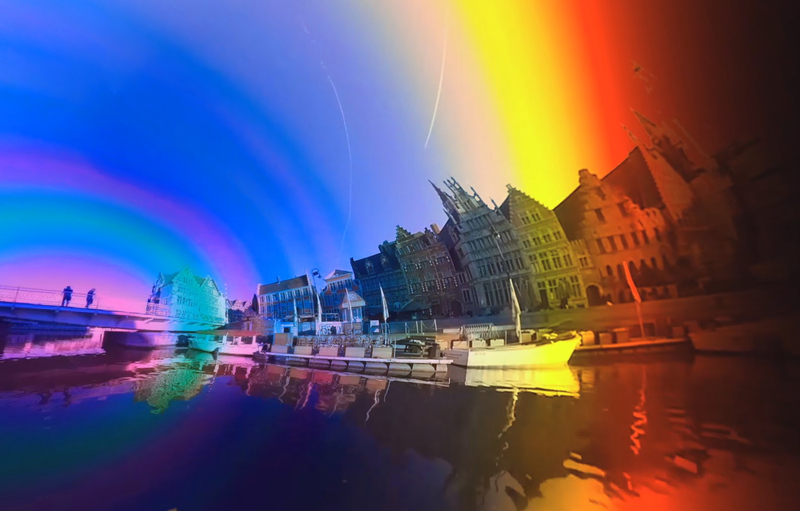 You can also discover there how the crazy rainbow effects are connected to the greenhouse effect and why the dark is indeed not a black hole. Finally we are ready to move. As you can imagine the experience of movement depends crucially on the nature of time. When Maja exclaims rather euphorically: “We get some speed for free, time slows down as we speed up,” she is referring to the curious time dilation. But what does a slowdown of time actually mean, after all we all move forward in time at a constant rate of one second per second? 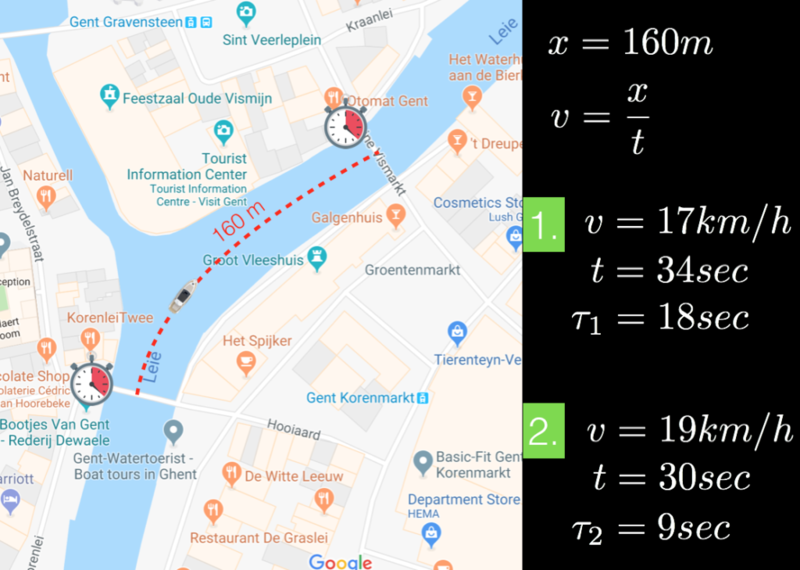 Let us take the part of the boat trip between the second bridge (de Grasbrug) and the third bridge (de Vleeshuisbrug) and consider two different velocities along this section: 17km/h (as in the final movie) and 19 km/h. Observers at the bridges would time these trips at 34sec and 30 sec. However, on the boat these trips take much less time! You can see this for yourself in the clip below. At 85% of lightspeed (17km/h, right-hand view) time has slowed down by a factor of two, at 95% of lightspeed (19km/h, left-hand view) it has slowed down already by a factor of three.